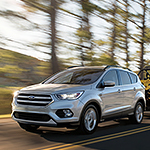 2 Convenience Features of the Ford Escape | Beaman Ford Inc. The Ford Escape is a popular compact SUV with 68 cu. ft. of cargo capacity. It's equipped with several convenience features, such as push-button start and foot-activated liftgate. You can test drive the vehicle at Beaman Ford Inc. in Dickson to see how it performs. The Ford Escape provides intelligent access to the driver's seat via push-button start. You can enter the SUV without needing to turn a key. The door automatically opens when you have the Intelligent Access key in your pocket or bag. Inside the car, you can start the car with the push of a button as well. Another way the SUV makes life easier is by opening the liftgate of the car when you kick your foot underneath. You no longer need to set your bags on the ground to open the liftgate. We have found the Ford Escape to be a very convenient compact SUV to drive. It largely eliminates the need for inserting a key into the lock. As a result, you can gain faster access to the cabin and the cargo area.